These muffins are moist and packed with Flavour! Preheat the oven to 375 °F (190 °C). Line muffin tins with paper cups. Fill any empty wells with water. In a large bowl, combine the flours, flaxseed, cocoa, baking powder, baking soda, and salt, stirring well. In a medium bowl, whisk together the eggs, bananas, coconut milk, oil, maple syrup and vanilla. Pour into the dry ingredients and stir until almost combined. Stir in half of the chopped chocolate. 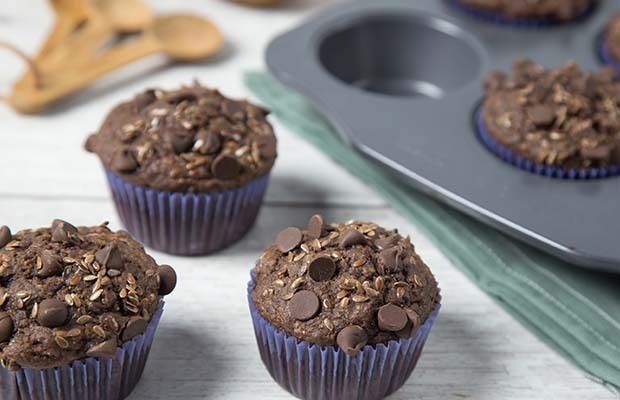 Scoop the batter into muffin tins and sprinkle remaining chocolate and flaxseed on top. Bake for 18-20 minutes, until a toothpick comes out clean when inserted into the middle. Remove from the oven and let cool on a wire rack for 10 minutes. Remove from the muffin tins and let cool completely. Serving Size: 1 muffin. Each piece contains 1 Tbsp (15 mL) ground flax.